See this car? Looks pretty old, right? Well that's how Morgan styles 'em, but it's actually a brand-new model, and brings with it an array of firsts for its cottage-industry manufacturer. Revealed today at the Geneva Motor Show, the new Morgan Plus Six is built atop an all-new, bonded-aluminum CX-Generation platform. It's also the first Morgan to use either a turbocharged or inline-six engine, and is said to be "the most dynamically capable production Morgan ever.” And despite its decidedly old-school appearance, it only carries over one percent of its 4,000 parts from any previous model. The new Plus Six is motivated by a 3.0-liter turbocharged straight-six kicking out 335 horsepower and 369 lb-ft of torque. 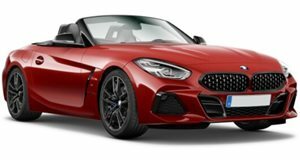 The B58 engine is sourced from BMW, which slots it into everything from 1 Series to the 7, including the new Z4 roadster (and Toyota Supra). Mated to an eight-speed automatic, the German powerplant propels the classically styled roadster to 62 in just 4.2 seconds and on to a top speed of 166 mph. And it'll return 38.2 miles per gallon along the way. Arguably even more vital to the Plus Six's advancement is the all-new architecture on which it's based and which is slated to underpin every new Morgan to come over the next decade. It's both lighter and stiffer than the previous platform, and offers more interior space as well. It features an adapted MacPherson strut front suspension and a compact 4-bar linkage at the back. Atop that aluminum platform, the craftsman at Morgan's workshop in Malvern Link still hand-build an ash-wood frame, just as they always have. But it's thicker and wider than the previous Plus 8's. The exterior design, while timelessly and instantly recognizable as belonging to Morgan, incorporates more vents to hint at the muscle residing beneath. It even has automatic headlights – something we've long since come to expect on any "modern” automobile, but are installed for the first time on a Morgan. And the interior is not only more spacious, but subtly integrates an LCD screen into the dashboard inspired by a 1950s aircraft cockpit. With each model built to order, buyers will be able to select from a nearly endless array of paint finishes and leather interiors. There'll be several trim levels offered, with pricing starting at £77,995 (about $103k at today's rates). The order books are open now for the initial two First Edition models, priced from £89,995 (~$118k).